Do you find that the daily demands of social media promotion are increasing? Our time is our most precious asset and social media is great at eating into it! Thankfully, there are several wonderful tools that can help. Here are 9 social media tools that will help you save time and improve your productivity. To be effective on social media you need to engage with people, build strong relationships, and then continue to nurture and maintain those relationships. Nimble is a social relationship management tool that is designed to help you do this. Nimble has recently become integrated with Hootsuite so you can manage your important relationships directly from the Hootsuite dashboard. If you come across a contact in your Hootsuite stream that you want to nurture, you can easily add this contact to your Nimble acount. Then, you automatically have that contact created within Nimble, including their personal information and any other social media profiles that Nimble finds and automatically assigns for these contacts. Once the contact is in Nimble, you can monitor their social streams, initiate conversation, or interact with relevant updates. All interactions are recorded in Nimble so you always know who you have and haven’t been communicating with. If you want to be more productive and proactive with your online relationship management, trying using Nimble. There are some social media tasks that should never be automated, and there are others that make perfect sense. Dlvr.it allows you to automate blog post delivery to social networks. Simply specify a source or channel where the content is coming from and a destination to where you want the content to go as soon as it’s published. In the example above, the source is a blog’s RSS feed and the destination is a Twitter account. Dlvr.it monitors the blog feed so when a new post is picked up by the RSS feed, it will automatically be delivered to the attached Twitter account for publishing there. With the free account, you can add up to 5 different blogs and send to 3 different social accounts, including Facebook and Twitter. Make sure people are seeing your blog content as soon as it’s published by configuring your own Dlvr.it account. Sharing great content is essential for building up your audience on social media. But the time that you find this content it might not be the best time to share it. If you spend certain times during the day browsing the news, you may come across many articles at the same time, but don’t want to share them all at once. BufferApp solves this problem by allowing you to queue up your content for sharing at predetermined times later in the day. Buffer provides other great features such as analytics on all of the posts you send out. 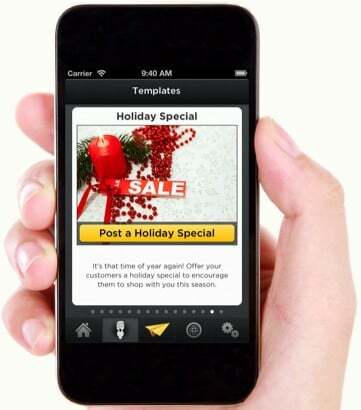 Imagine you are out of the office, when suddenly, you form a great idea for promoting a special offer for your business. Do you ring up your graphic designer and pay for a nicely designed template and then share it on your social media channels when you get back to the office? No! You can just use Glyder instead. Glyder allows you to select a visually appealing template, add in your company details, change the boilerplate text with your specific offer, and then send to a variety of social media platforms. As I mentioned earlier, time is an important asset in the digital age, so it’s crucial to move quickly when it comes to social media promotions. If you’re able to send professionally designed messages to a variety of social media platforms in less than 30 seconds, you’re able to create real-time value for your business. Keep in mind that Glyder is currently only available for iPhone, although they are working on releasing an Android application as well. You are probably already aware of Google Alerts, a free tool provided by Google that sends you email notifications based on mentions of particular keywords on the web. If you are using these alerts to find content to share, you may have found that there is still a lot of work involved in going through every piece of content to make sure it’s interesting and relevant, not to mention the time it takes to create and schedule each post. Bundlepost helps to automate this process. Your alerts are saved as social media drafts in your account. You can then take a look at these posts and decide which ones you want to share. Once you’ve decided which ones you’d like to share, the content is packaged up with scheduled times and hashtags so you can export from Bundlepost and import it into Hootsuite. Now, you have a stream of content ready for distribution. If you are an active user on Pinterest and you want to save time then you should be using Pingraphy. Pingraphy works as a browser plugin that lets you pick images from the web and then schedule them out for sharing at a later date. You specify the board on which you want the pins to appear, a scheduled start time for publishing, and how long you want to wait between each pin. Pingraphy will schedule the posting of these pins based on the interval you provide. You can waste a lot of time sending tweets at times when your fans aren’t listening. All your followers will not be online at the same time, of course, but there are times when the majority of them are online. These are the most optimal times when you should post content, so take advantage of them by using SocialBro. SocialBro does an analysis of when your Twitter followers are online and provides you with options of best time to tweet. The more followers you have online, the bigger the circles and the more optimal the timing. SocialBro also integrates with BufferApp so that once you’ve identified the right times, you can automatically set those times up with Buffer. Enagag.io brings conversations and comments into one location so they are easier to track and manage. Anything you or your readers comment or respond to will be pulled into your Engag.io dashboard. It doesn’t matter if the conversation is happening on your blog or other blogs. 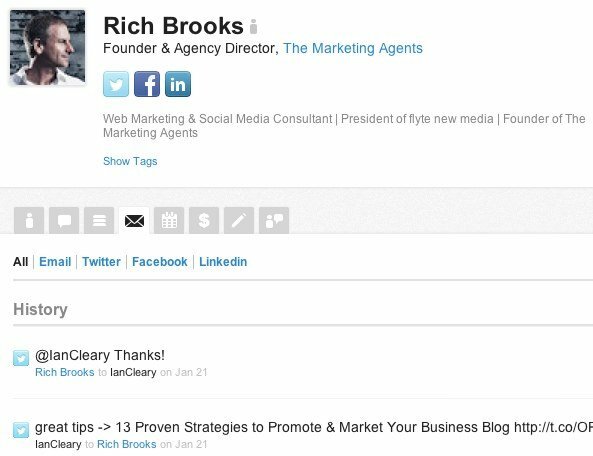 In addition to blog comments, you can also track conversations on other popular social networks such as Twitter, LinkedIn, Google+, Facebook, YouTube, Foursquare, and Tumblr. Plus, you can use Engag.io’s search engine to find conversations you may not be involved in but should be. So, if you are finding it difficult keeping track of all the conversations you are having, Engag.io is the answer to your problem. If you want to curate great content for your networks, then you’re likely going to have to read a lot of content in order to pick out the best articles for sharing. You may not have a lot of time to read content at work, but maybe you have some spare time waiting for a bus or in between meetings while you’re out and about. 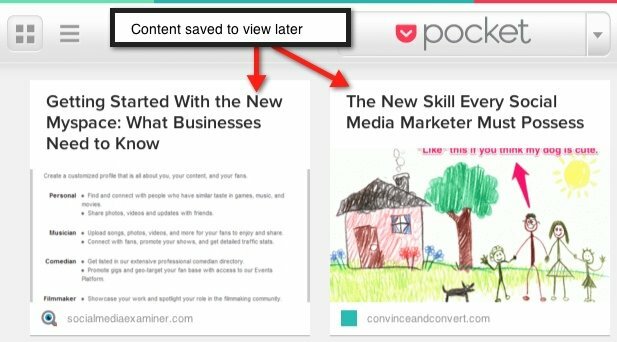 Pocket allows you to highlight interesting content on the web and save it for reading later on your iPad, iPhone, Android phone, or desktop device. Getting to read more content means you’ve more great content to share, which is helpful for everyone in your network. These are just 9 tools that will help you become more productive with social media. We’d love you to share your tips and tools for social media productivity in the comments below!